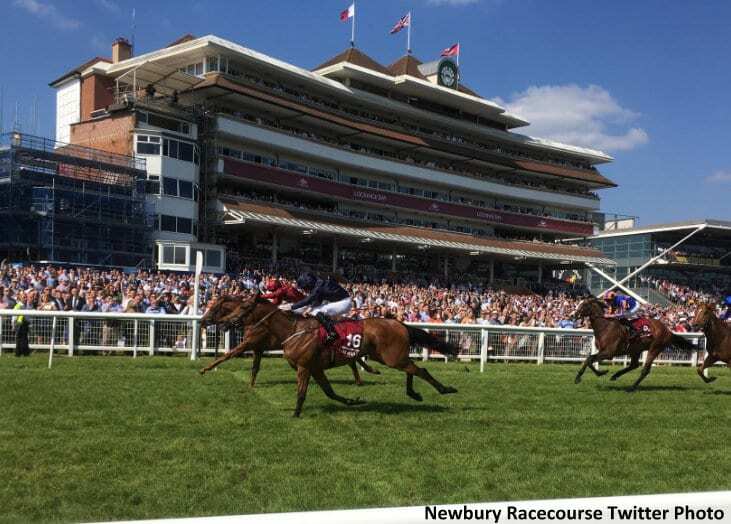 Coolmore's Rhododendron enjoyed a drop back in trip in Saturday's Group 1 Lockinge Stakes at Newbury, scoring a thrilling victory for the Ballydoyle crew when denying last year's runner-up Lightning Spear. The 4-year-old daughter of Galileo and jockey Ryan Moore were a head in front at the line, earning her second Group 1 victory at the mile distance. She also captured the Group 1 Fillies' Mile as a juvenile. Last year, Rhododendron recorded a victory over 1 1/4 miles in the G1 Prix de l'Opera before finishing second by a length in the Breeders' Cup Filly and Mare Turf at Del Mar. Her first start of 2018 resulted in a fourth-place finish behind Cracksman in the G1 Prix Ganay, but the Aidan O'Brien trainee could now be headed to the Queen Anne Stakes at Royal Ascot. This entry was posted in NL List, Racing and tagged aidan o'brien, ballydoyle, coolmore, galileo, lockinge stakes, Newbury, Queen Anne Stakes, rhododendron, Royal Ascot, Ryan Moore by Paulick Report Staff. Bookmark the permalink.